Workshop date to be planned for figuring out what to order and where. Expect begin of next year. I've recently finished my first quadcopter build (justa_copter_1) and have gone through the throes of learning how to fly it (justa_learning_to_fly). This obviously means that I am now an expert in the field of quad-copters and am fit to edumahcate the masses on proper construction and flying of these things, right ? Well, let's just say that I know that there are at least a few people also interested in getting up to speed with this whole multi-rotor thing and it might be nice to do a series of talks and/or workshops on the subject to get people familiar with the concepts, up to speed with the required materials/skills and finally get the aircrafts constructed and flying. 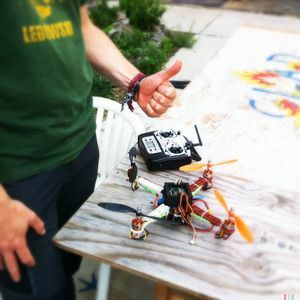 A talk on the basics of quadcopters, what makes them fly, how they are put together and what is required to do so. A write-in for a workshop (series). Planning phase: What do you desire, what platform/design satisfies your needs. Explanation of the different options. Propellers: At around $3 per set of 4, you'll want a few sets, they do tend to break. Let's say 4 sets for $12. Possibly prop-adapters: often supplied with motors. Good to have a few spares. $4 per set. The justa_copter_1 has a transmitter I bought for a different purpose, before. I did by a battery-charger that is 'future proof' and will charge more heavy duty batteries as well as the ones I currently needed. I aim to start the first of the above series at the next first TECHINC presentation-parties and proceed to do the next parts in the months directly after that. If you have any questions or remarks beforehand (or during) please contact me! Since the announcement on 20130821, a fair number of people have voiced their interest in attending the workshop(s); either to construct a (new) multirotor from scratch, to repair/fix their earlier attempts or to simply 'soak in the atmosphere'. To this end; I've decided to place the first talk before the end of september; hopefully combined with a 'party' of other talks/etc. Workshops to follow soon/directly after. The following list of people replied on the mailinglist. I will list their aliases (where available). To keep track of all the stuff already done, I'll keep a list of materials/stuff produced for it below. 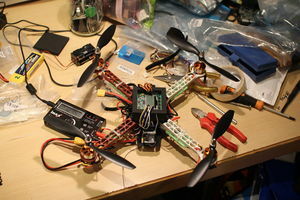 Slides of the Quadcopter Workshop given on 20131130, for those who missed it. 137 slides; enjoy. Please do not re-use without permission. This page was last edited on 21 December 2013, at 14:14.